Ashley, aka WKD Ashley, is a white & red, 4-year-old female born August 7, 2004. Her sire is Naughty Waltz, making her grand sire Molotov, and her dam is CK Devon, making her grand sire Gable Dodge. 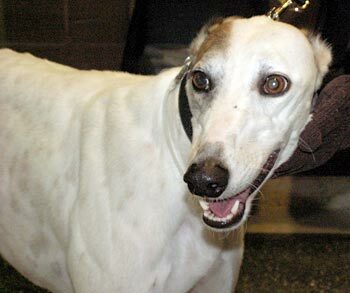 With a heritage like that, Ashley was headed to be a winner, with 74 races to her credit, starting April 1, 2006, at the Southland track in Arkansas, moving to Dubuque in Iowa, and finishing on November 29, 2007, at Valley Race Park in Harlingen. Ashley suffered a class 3 fracture of her left rear central tarsal bone. Surgery was performed on Friday, December 21, 2007, with Dr. Bob Radasch of the Dallas Veterinary Surgical Center. Ashley’s leg healed, and she was released from on February 11, 2008, by Dr. Radasch. Ashley was adopted soon thereafter, but alas, it was not to be Ashley’s forever home. She was returned, along with Hannah, through absolutely no fault of her own. It has been determined that Ashley is not cat tolerant. Ashley is a fun-loving girl who is ready to gently give out kisses whenever a face is nearby. She has never met a stranger and greets everyone with a wagging tail and those kisses when possible! Ashley likes to greet all houseguests and then will soon retire to her bed and hang out close by with a toy to make sure that she does not miss out on any of the fun. She likes all toys  from the soft squeaky ones to the indestructible chew bones. She also likes to carry around a tennis ball, but is not a very good retriever! Ashley likes her crate and goes in nicely, knowing a treat is coming soon! Like many greyhounds, she will often nap in the crate when the door is open. And in typical greyhound fashion, Ashley will follow you from room to room, making sure she does not miss any excitement. She gets along well with the other greyhounds in the house and has learned her house manners remarkably well. This adorable, petite girl is confident and friendly and should do well as a single pet or with other medium to large dogs. She does make sure she gets her fair share of petting, but she is not an attention hog! Although Ashley has not been around children of any age, I don't think she would mind an active house with children who are respectful of animals. Some family will be very lucky when they adopt this cutie pie!